FILE - Health workers are seen wearing Ebola protective gear at an Ebola treatment center at Tubmanburg on the outskirts of Monrovia, Liberia, Nov. 28, 2014. U.S. President Donald Trump introduced the new national strategy for combating disease outbreaks and bioterrorism Tuesday, on the anniversary of the 2001 anthrax attacks on the United States that left five people dead. In a statement, the president said, "Biological threats emanate from many sources, and they know no borders." In the 2001 attacks, letters containing anthrax spores were mailed to two Democratic U.S. senators and several news media outlets. Five people died in the attacks, and another 17 were infected by exposure to the spores. The identity of the person responsible for the letters was never discovered, although the prime suspect, a government scientist, committed suicide in 2008. This year's strategy, the president said, builds on lessons learned from past biological incidents, including not only the anthrax attacks but the 2009 U.S. outbreak of influenza and the Ebola virus epidemic that killed thousands of people in West Africa in 2014. FILE - Health and Human Services Secretary Alex Azar attends a hearing on Capitol Hill in Washington, June 26, 2018. 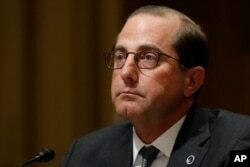 Trump said he has authorized Secretary of Health and Human Services Alex Azar to serve as the federal lead in coordinating implementation of the national strategy. He said he has also established a cabinet-level biodefense steering committee, and directed National Security Adviser John Bolton to review threats and prioritize biodefense actions annually. In a news briefing Tuesday, Azar told reporters that biological threats are "very real, and they're growing." He said this year's strategy is the first by the U.S. to include naturally occurring threats. Previously, the national biodefense strategy focused on the weaponization of biological threats by enemy forces. But Bolton told reporters at the briefing that there is no "particular immediate threat" of a biological attack. Ashley Arabasadi, chair of the Global Health Security Agenda Consortium, told VOA on Tuesday that her collective welcomes the release of the strategy after several delays. However, she said in an email, "the administration's actions do not match its words." She said the Trump administration's proposed budget cuts health security funding to the Centers for Disease Control and the U.S. Agency for International Development, and withdraws unspent funding for Ebola defense. "Without funds, we cannot continue to implement the programs on the ground and ensure that we are making the world [and the U.S.] safer from infectious disease threats whether natural, man-made, accidental, or intentional," she said. The Global Health Security Agenda Consortium is an international group of nongovernmental organizations that promotes cooperation on world health security needs and defends against infectious threats. White House correspondent Patsy Widakuswara contributed to this report.